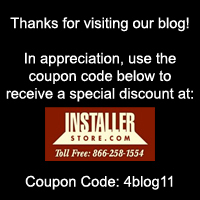 Save 10% on all Zoroufy products on Installerstore.com with coupon code "zor10deal". Orders must be placed by phone. Office Hours M-F 8am-5pm CST. To celebrate, we are offering 10% off all Zoroufy Stair Rods, Wall Hangers, Floor Registers and Baseboard Diffusers during the month of April. Browse our Zoroufy products here on our site. Once you’re ready to order, call our toll free number 866-258-1554 and speak with one of qualified sales representatives. Mention the code “zor10deal”, and receive 10% off all Zoroufy Products! Want to see an example of how much you can save? Let’s say you were in the market for a Rug/Tapestry Wall Hanger for your grandmother’s antique rug she left you. You decide on the Grand Regency Collection (because of its gentle clip design) in Polished Brass and the Pineapple Finials. You need just (1) of the 36″ Base set. Normal retail pricing is $198.50 per set. If you order by phone, you already get special pricing discounts, which drop the price down to $148.99 (savings of $50!). If you also mention the code of “zor10deal” you receive an additional 10% off, which drops the price down to $134.09. This give you total savings of $64.90!!! Making your home look like a million bucks doesn’t need to cost a million! But don’t forget- orders need to be placed by phone and the sale is for April only.